US Secretary of State Mike Pompeo departs from Israel's Ben Gurion Airport, following two-day trip to the Jewish state. US Secretary of State Mike Pompeo departed from Israel’s Ben Gurion International Airport Friday morning, following a two-day visit to the Jewish state. 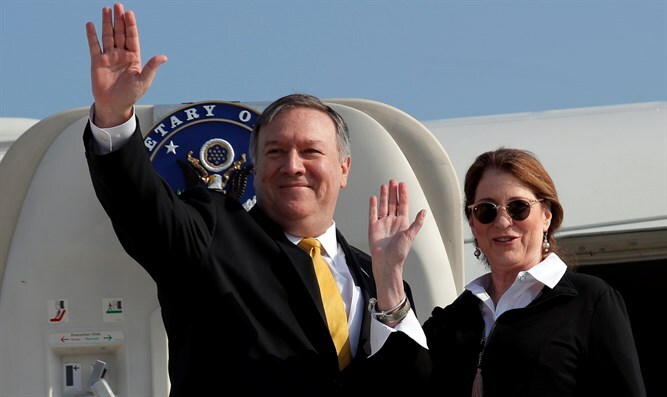 Pompeo and his wife Susan headed to Beirut Friday, in a visit which is expected to focus on the Lebanese terrorist organization Hezbollah, and the influence of Hezbollah’s patron, Iran, in Lebanon. During his visit to Israel, Pompeo visited the Western Wall and the Yad Vashem Holocaust Memorial Museum in Jerusalem, where he declared that the US “has a moral and political obligation” to confront “hostile forces” in the Middle East. The US Secretary of State met with Prime Minister Binyamin Netanyahu and President Reuven Rivlin during the visit, which coincided with President Donald Trump’s historic decision to recognize Israel’s annexation of the Golan Heights. "Tonight, President Trump made the decision to recognize that that hard-fought real estate, that important place, is proper to be a sovereign part of the State of Israel,” said Pompeo, following Trump’s announcement. "The people of Israel should know that the battles they fought, the lives that they lost on that very ground were worthy, and meaningful, and important, for all time," he said.